The Book’s blurb before the recipe suggests that this dish is equally good as a breakfast dish, or for dinner. I’m not convinced that it belongs in the breakfast section at all. I wanted to make a fritatta as a simple way of doing eggs for a crowd, but this dish is actually more of a potato pancake bound together with eggs. I’m a great fan of fritattas because they’re so hands off. I use them as a fridge cleanup device. On a Saturday morning we’ll make coffee, and haul all the tags ends of vegetables out of the crisper, chop them up and brown them in a cast iron pan. While they’re frying we go over the weeks leftovers, and see what can bulk up the fritatta, if we find leftover steak we celebrate, leftover chili makes it a Mexican fritata, and potatoes are an especially prized find. I tried adding leftover rice, but it wasn’t too successful. Once anything and everything is in the pan, I pour a few beaten eggs over top, and leave the pan on the burner for about a minute. I then sprinkle some grated cheese over the still liquid eggs, and pop in in the oven under the broiler for about three minutes. Once the cheese is browned and bubbling I take it out. Like a quiche the centre should still be a bit wobbly as it will continue to cook with the residual heat in the pan. 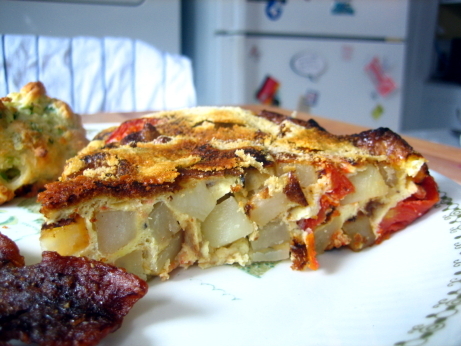 The fritatta is a standby improvised dish for us, but the proportion of eggs to other stuff is a constant. I fight with my impulse to use up all the leftovers, because an overloaded frittata is just no good. This particular frittata starts by making a mixture of eggs and egg whites, Parmigiano-Reggiano, sliced basil, salt, and pepper. You then lightly brown garlic in a skillet, remove it, and soften diced potatoes in the pan. The potatoes come out, and tiny grape tomatoes are browned until their skins split. Then the potatoes and garlic added back in, and the egg mixture is poured overtop. The eggs cook for 3 minutes uncovered, and 5 mintues covered on top of the stove, then gets put under the broiler for 5 minutes more. Parmesan is sprinkled on top, and put back under the broiler to brown for 2 or 3 minutes more. Then in a nerve wracking move you slide the fritata onto a serving place, and slice it into wedges. For those of you who are counting, the fritata cooked for 15-16 minutes. My standard fritata is nicely set after 5, not surprisingly the eggs in this dish were overdone and dry. I misread the instructions, and sprinked the cheese on top before it went under the broiler for the first time, so the parmesan was overdone by the time I took it out, but that’s my fault. My main complaint was the proportions though, by weight there was as much potato and tomato as egg in this recipe, and I was really looking forward to a much eggier dish. I think the basic concept of this frittata is solid, but I wasn’t thrilled with the excecution. The potato-garlic-tomato-basil flavour combination is a good one. My ideal version of this dish would use more eggs, cook them less, mix up the cheeses (think goat), add fresh basil on top, and cut the potatoes into larger chunks so that they could be browned before going into the fritatta. To me the frittata is a casual and convenient dish, and this version was a bit too overwrought for my tastes, the ingredients in the pan, ingredients out of the pan dance was more effort than I’m willing to put into what should be a very straightforward breakfast. My standby whatever-you-have-on-hand fritatta is much simpler, and ends up tasting better than this one does, so I’ll give it a miss next Saturday morning. I like fritatta, but only for breakfast. I still think eating egg dishes for dinner is a little weird. The best fritatta is indeed the “whatever you have on hand” kind. Great way to use up left over veggies. Eggs for dinner are great. I love breakfast for dinner nights, and quiche makes an excellent supper too. Cast iron cookware is hands down the best. I used non-stick pans for years, but a nice steak done in a cast iron skillet is on a completely different level. Besides, you can buy a quality skillet for under 80 dollars and it will probably outlive you. The non-stick cr*p may last 3 years if you get lucky. If you dig around a bit, you can often get a quality pan for a discount. There are always some good offers on cast iron cookware listed on the cast iron pots website. Alright, that did it for me, now I’m salivating. I’m off to the kitchen to fry up some steak and eggs. Having just discovered the greatness of organic farming in our own garden, I have to say potato soup is our favourite of the month. I found a website dedicated to potato soup recipes, can you believe it?!. There’s a website for anything nowadays it appears!